If you are looking for a very small electric dehumidifier to protect equipment or valuables in enclosed spaces from moisture damage, Rosahl offers a range of solid state devices that remove water vapour at a molecular level before damage can occur. 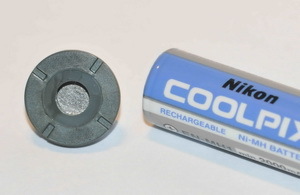 The PD model shown here is for volumes up to two litres is 75% smaller than a standard AA battery. The advantage of Rosahl dehumidifiers is that they do not require servicing or maintenance because the moisture is removed by electrolysis when a low voltage is supplied to the device. The same action allows Rosahl membranes to be used as humidifiers if required. The Rosahl dehumidifier is normally mounted in the side of the enclosure, where its solid-state ionic membrane attracts moisture from inside and breaks it down into hydrogen and oxygen. The hydrogen ions are then forced through the porous membrane to the outside world where they recombine with oxygen in the air to form water vapour. Rosahl is economical to run as it is designed to remove moisture slowly from enclosed spaces up to two cubic metres in size. Enclosed spaces up to eight cubic metres can also be accommodated using multiple membranes. For Rosahl to be effective the enclosure needs to be sealed against further moisture ingress. Find out more about humidity here. Another advantage of using a solid-state dehumidifier is that there are no moving parts to wear out and no noise or vibration. This gives Rosahl a service life of many years and low lifetime operating costs.